Situated on 37 picturesque country acres in Brinklow, Maryland, Rivermist Pet Lodge has been providing exceptional pet care for 49 years and counting. Just a short drive from Howard County, Rivermist is Maryland’s premiere dog and cat boarding facility. 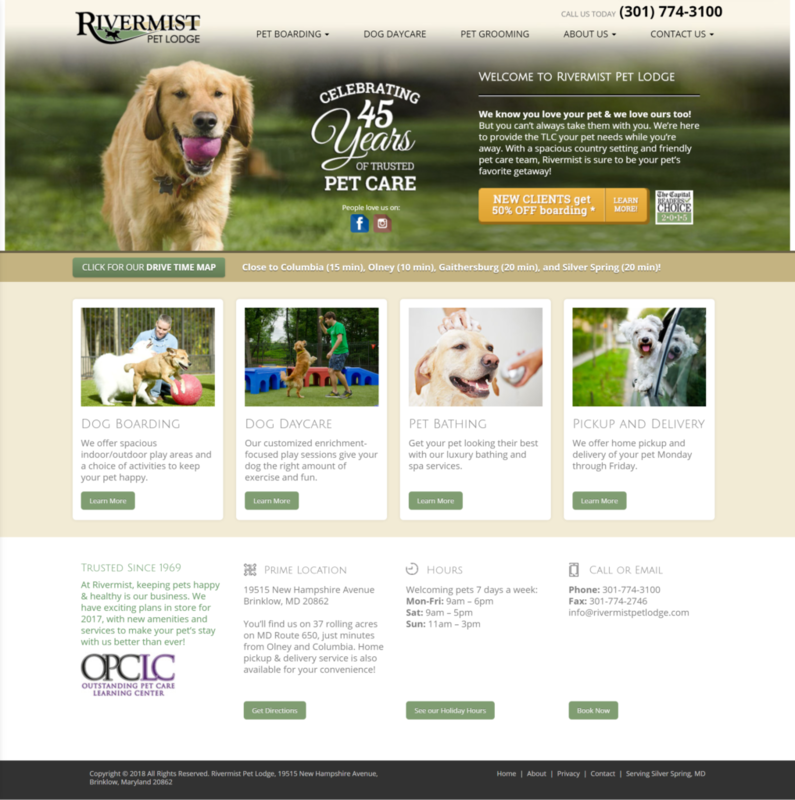 Rivermist also offers pickup and delivery services, manners training, and a wide array of pet spa options for pet lovers and their four-legged friends. Rivermist prides itself on its trained, compassionate team, as well as its clean, climate controlled facilities which are monitored 24 hours a day, 7 days a week for its guests’ safety. Prior to working with IMPACT, the company had been using an out-of-state digital marketing vendor who specialized in the industry. Business was going well, with a steady influx of new business, but owner Scott Simon somehow sensed that while things were good – they could be great. As a result, he began to seek more of a partnership with a local marketing company. His instincts were spot on. Since hiring IMPACT, business boomed for Rivermist Pet Lodge. As an example, reservations increased more than 50% in June 2018 compared to June 2017. Rivermist had been running five active Google Ads when IMPACT was called in. Our digital marketing team discovered a herd of issues therein requiring a bit of professional grooming. Trimming these campaigns of all excesses, our PPC specialists implemented multiple changes to bring them in line with best practices and increase ROI. Removed all “low search volume” keywords. Eliminated location targeting overlaps within and between campaigns. Used ad scheduling consistently across all campaigns. Linked Google Ads & Analytics to better track conversions. Created dedicated landing pages with forms. IMPACT’s aggressive PPC management resulted in improved results and far more accurate ROI. In just a year’s time, Rivermist conversions nearly tripled, increasing by a whopping 279%. The boarding facility is also experiencing many more repeat customers.